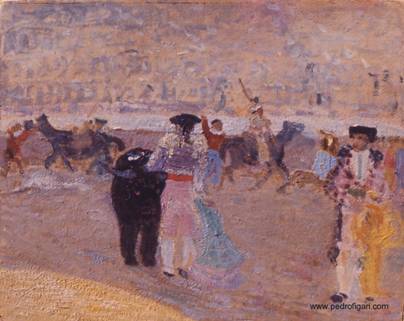 Pedro Figari painted well over 60 pictures on the subject of bullfighting. He had attended them in Uruguay towards the end of the XIX century, and no doubt in Europe too. No doubt, also, that he painted them inside his Paris Studio. Jorge Páez Vilaró used to tell me that for a show held along the 1930 Olympic Games in Los Angeles, Figari sent pictures on that subject, so I find it wise to estimate that he painted most at about that time. 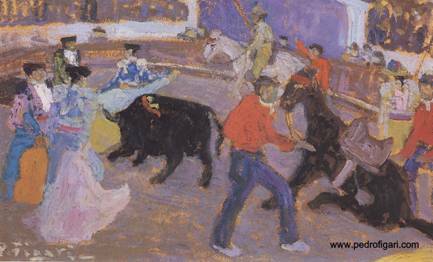 ...He used to go and see bullfights in La Unión (now close to downtown Montevideo), influenced "by the clamor of that feast of light, of strength, of ability and of blood, where the imagination is at every moment transported to medieval legends". When a bullfighter died in action in 1888, bullfights had been forbidden, but they simply started all over again, but while they were being discussed in Parliament, the Department of Justice cancelled them. Figari as a Member of Parliament admits that the spectacle fascinates him, but votes against it. (El Dia, Montevideo,June 20, 1900). Apart from La Unión, there were bulfights in Montevideo in El Cerro (another neighbourhood of Montevideo), and in the Department of Colonia, just across the river from Buenos Aires - it is an Argentinian who built the arena, which still stands.